We want you to be the first to know about our unique new website. We are excited and hope you are too. Our goal is to express the depth and beauty of our award-winning print journal into an easily navigated online website that is updated weekly and includes mixed media. Yes! We will be now be making weekly changes to keep you informed and engaged in all phases of co-creating the new civilization. We consider you, our subscribers, to be mission-driven as we are. Together we recognize that humanity is in the midst of evolutionary transformation of enormous scale. As old systems break down, we renew our commitment to inform, inspire and engage individual and collective participation in a global shift toward an expanded planetary consciousness and the transformation of societal structures that reflect this shift. Don't miss the section on our exciting new programs and new staff. You will find stunning visuals in all sections, including those devoted to transforming our institutions—new economics, governance, spirituality, science and more. There's up-to-date news about the Global Citizens Movement, the Commons, Integral Worldviews, Living Earth, People Power and how you can be involved. Surprise! View Kosmos' first video exclusive, What is a Global Commons?, featuring two leading-edge, evolutionary thinkers, David Bollier and James B. Quilligan. Print and Digital subscribers will be able to access all articles, back issues and galleries from our print journals and newsletters. For others there will be access to the site and 3 free articles as well as Creative Commons licensed articles . Welcome to our new Webmaster, Karen MacKenzie. A big thank you for the fabulous job you did designing and developing our new website with the help of our new communications consultant, Rhonda Fabian. 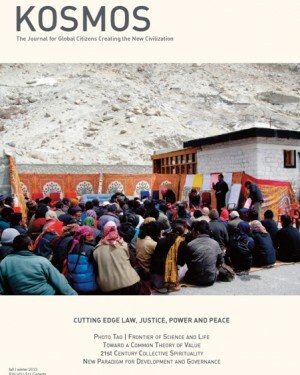 Become a member and subscribe to Kosmos Journal today. 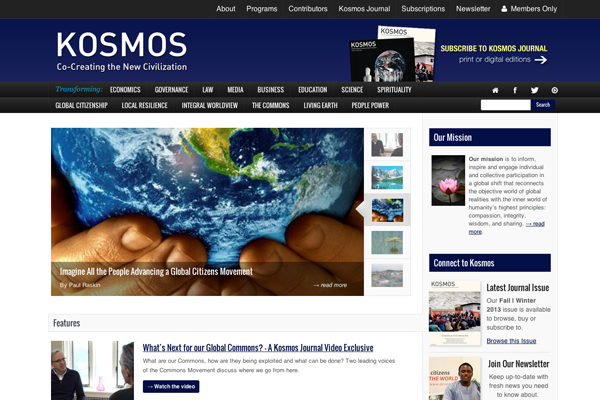 As a member you will have access to the entire collection of Kosmos articles and galleries.